You probably do not remember me but I came and looked at a horse you a had at one point. (First Dance). Timing wasn't great on my end but ultimately I contacted her owner and did purchase her a few months later. I just wanted to let you know that I do tell anyone looking for a dressage horse to take a look at your site and contact you. You were wonderful, and ultimately if my first experience of meeting and riding her wasn't a good one I wouldn't have tracked her down. You were very professional on every level, and if down the road I look for another partner, you will be one of he first places I contact. .
"My friends know I hate riding strange horses and having to do it in front of other people was almost beyond me. From the minute I met Carol, to the minute I left, I had a great time. I really didn’t even plan on coming home with a horse, till I met Kate. Carol made the whole process fun and very exciting." "I don't know whether you remember me but I train with Patricia Norcia up in Connecticut and I bought a little bay "Azteca" gelding named Centares from you six years ago. We just had a dress rehearsal for an exhibition coming up at ERAHC and I wanted to send the attached picture so you could see how well the little horse is turning out and to thank you again for selling him to me." "Here is an update on Paul's and my first show season. Paul has been cleaning up in SHIH at the Arabian Shows. The judges love him and the other exhibitors are not happy to see him show up. The first picture is of us waiting to go into his first class at the Arabian Sport Horse Regional Show on 7 Sept and the second shows what he won. It was the largest turnout ever for the SHIH at our regional show, with entries from across the region (Arabian Horse Assoc.of Eastern Canada - Ont, Que, and the Maritimes) and also from Maine and New York States. Once our coach was well and back to work, Paul and I worked very hard and finally made it to a dressage show. On 24 Aug.we entered the last Dressage Niagara Show of the year, an open, all breed show. We placed 3rd in both classes, were not last by a long shot!!!! He was distracted in the ring, but very well behaved especially around all the noise, people, sound system, moving vehicles etc. I am so very glad I bought Paul and then you for your patience during the purchase process. I love this boy soooooooooo much and he is rebuilding my confidence, stronger than ever. We are a team!" nothing more wonderful than the relationship between horse and rider. A perfect ride, an almost perfect ride, the smell of leather, the smell of horse sweat, the sound of your horse's nicker when he sees you, the simple sound of your horse chewing hay -- these equine things are so satisfying and joyous to the horse owner. However, when the time comes, for whatever reason, that the horse owner has to sell her/his horse, there is nothing more traumatic, heartbreaking and nerve racking. Carol Seaman, from Outfoxed Farm in Chester, N.Y., takes this challenging experience away from the horse owner. With her beautiful farm and website, the horse is advertised, video taped, and presented in a professional, friendly manner. Carol has a huge equine network that reaches out to anyone interested in purchasing a horse. 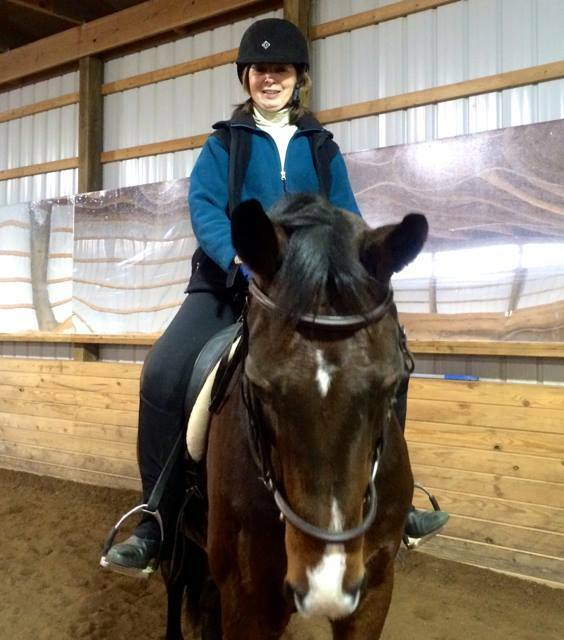 Carol is highly professional and knowledgeable in assessing the perspective buyer's riding ability -- if it is not a good match, she will not place that rider with the horse. I wanted to once again thank you for providing such a friendly and professional environment for us to horse shop. It was a very pleasant experience purchasing the Dutch gelding, Tempo, through Outfoxed Farm and I am especially impressed with your excellent representation of Tempo – he was exactly as advertised. It was a complete pleasure to do business with you and your lovely staff and my client and I were made to feel so welcome, we began to feel like family. My client and I continue to be thrilled with Tempo, he settled in immediately, and proves worth his weight in gold every day. My client is elated with her new boy, and that makes me very happy. I wish you all the best, and promise to keep Outfoxed Farm in mind next time I am horse-shopping. In some instances, trades are considered. In-house leases and payment plans are optional on some horses.